Solomon was a great king. While he did not carve his empire in the beginning, and was blessed to inherit a prosperous and great nation from a great King, his father, he made a great nation greater. While he was blessed to be able to build the temple of God only because God disallowed David’s stained hands to do it [1 Chron 28:3], he was a man of faith, and by faith he asked for wisdom [1 King 3:9|Article] and gained everything else under the sky [1 King 3:13]. Yet, he too, fell into sin. As Nehemiah nears the end of the book, he discusses the act of marrying foreign women, and used the most prominent example – King Solomon, and how even him! Even Solomon was led into sin by the foreign women. In this study, we will look into the life of Solomon, specifically why a man like him would fall in such a manner. This was the phrase used in several occasions to extol the Lord – Jer 10:6; 1 Sam 2:2; Exodus 8:10; Deu 33:26; Psalm 86:8, 2 Sam 7:22. Job 1:8 – Have you considered my servant Job? There is no one on earth like him; he is blameless and upright, a man who fears God and shuns evil. In hindsight perhaps it doesn’t seem that great, for other kings were thus described as well: Josiah [2 Kings 23:25] and Hezekiah [2 Kings 18:5]. He was loved by his God, and God made him king over all Israel – have you considered why, or how, Solomon became the king? David’s line of succession was never a straightforward one. David was a fantastic king, and in his time as king he fought and won so many battles, expanding the borders and stabilizing the nation to an extent whereby his successor, whoever it be, will have the path prepared for him. Absalom rebelled, desiring the inheritance of a kingdom that was never meant to be his. Solomon, without ever having to do much, became the King at a tender age. Was Solomon a man who was greatly blessed by God? I certainly would think so. 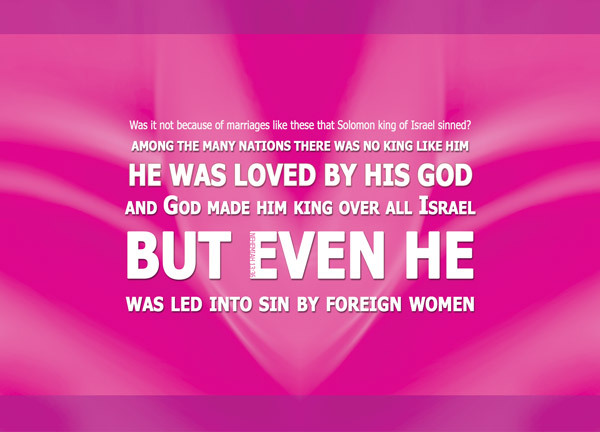 but even he was led into sin by foreign women – note the phrase but even he – even the great king Solomon, wisest man ever; king of Israel in her most glorious and prosperous days; a king like no other king, a man loved by God – but even this man sinned! He sinned by being led by foreign women – oh, he wasn’t the only one, certainly, but the emphasis here is that, even a man like him could be led into sin, if stepped into the snare of the foreign women. Let us look at how Solomon himself, in his later years of reflection, notes this: I find more bitter than death the woman who is a snare, whose heart is a trap and whose hands are chains. The man who pleases God will escape her, but the sinner she will ensnare [Ecc 7:26]. King Solomon, however, loved many foreign women besides Pharaoh’s daughter—Moabites, Ammonites, Edomites, Sidonians and Hittites. 2 They were from nations about which the Lord had told the Israelites, “You must not intermarry with them, because they will surely turn your hearts after their gods.” Nevertheless, Solomon held fast to them in love. 3 He had seven hundred wives of royal birth and three hundred concubines, and his wives led him astray. 4 As Solomon grew old, his wives turned his heart after other gods,and his heart was not fully devoted to the Lord his God, as the heart of David his father had been. 5 He followed Ashtoreth the goddess of the Sidonians, and Molek the detestable god of the Ammonites. 6 So Solomon did evil in the eyes of the Lord; he did not follow the Lord completely, as David his father had done. Was it not because of marriages like these that Solomon king of Israel sinned? – these referred to the preceding verses, where Nehemiah spoke about his encounter with the Jews who had married women of Ashdod, Ammon, and Moab [Neh 13:23]. From the passage in 1 Kings 11 above, we are clearly told that his wives – foreign wives, his 1000 wives, led him astray, turning his heart after other gods – the gods that they worship in their foreign lands and foreign cultures. And his greatest sin was always adultery – not so much in marriage, but in terms of his idol-worshipping. Today there remains great debate over whether it is ‘okay’ to intermarry – not within nations, but amongst different religions. Is it okay for a Christian to marry a non-Christian? Ask around, and surely you’ll hear all kinds of answers, with all kinds of reasoning. We cannot insist that the Bible spoke about this – it is nothing more than an interpretation, for the Bible never spoke about it literally. But in terms of significance, I think it weighs similar to the foreign nations of the past. What was the chief difference between Israel and her neighbors? It was really just about God. They worshipped their idols, Israel worshipped God. Even a man so pleasing in the eyes of the Lord was stumbled in his faith by the influx of foreign ideology into his life – even the wisest man on earth! None of us are too disciplined, or have too much faith. None of us are safe from temptation. None of us are immune. Hence all the more we require cautiousness. Perhaps things would have been very different, if Solomon had erred on the side of caution.